Take the complexity out of analyzing your most important asset. With Dell’s extensive Hadoop-ready library of business analytics solutions, you can easily create “what if” scenario dashboards, generate graphs for relationship analysis and innovate. Speed up complex/large cluster deployments with the Dell In-Memory Scale-Out Appliances for Cloudera Enterprise. It enables quicker access to critical business insights and is scalable from a single system to hundreds of nodes. Big data has become the next frontier for innovation, competition and productivity. To capitalize on the opportunity, your organization needs to find the solution that allows you to collect, manage, store or analyze data in order to use that data to your advantage. Join us to learn how you can implement cost-effective solutions for collecting, managing and analyzing data in order to turn big data into valuable business insights. Organizations continue to recognize the importance of data as the new currency and as a competitive differentiator. Data is being created and consumed at rates never before seen. This is not unique to a single industry; it is affecting all vertical markets. With organizations struggling to understand and adopt Big Data solutions, we want to offer an easy starting point to begin a complete Big Data solution. We simplify the procurement and deployment offering an all-in-one comprehensive solution that allows organizations to start their Big Data Hadoop journey with a bundled solution that includes the hardware, software, including the Cloudera Basic Edition, and services needed to deliver a Hadoop cluster to start on a proof of concept to begin working with big data. This proof of concept solution features a Hadoop bundle built for fast deployment, ease-of-use and includes an aggressive starting price point. How is the Internet of Things Driving the Adoption of Apache Spark™? 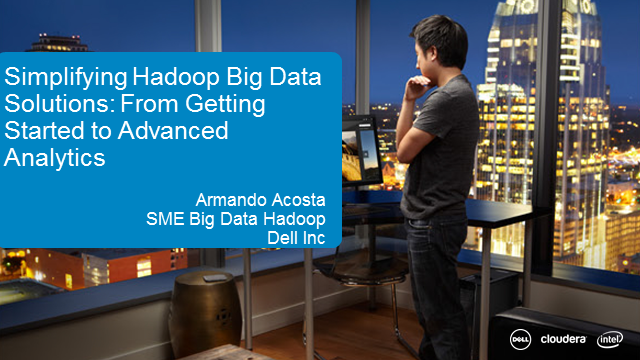 Explore the latest advances in the world of Big Data Hadoop solutions. Take this opportunity to hear and discuss new and important Big Data topics and the impact they will have for all interested in the future of Big Data. Hear from Big Data experts on what is available in the industry today, what’s anticipated, and why they think SPARK is the next big thing for Big Data. What is SPARK? Why is it relevant? How does SPARK play into a more intelligent use of data? Participate in cutting-edge discussions to understand how the latest technology trend, the Internet of Things, is driving business advantages across verticals, and how the Internet of Things will be driving further adoption of SPARK. Don’t miss the chance to hear from and ask the experts! Organizations gaining insights from vast volumes and varied data types find that big data requires big power. Dell, Intel and Cloudera, three leaders in big data, have teamed up to deliver end-to-end solutions that provide that big power. Join us to learn how organizations have been using big data to drive insights for measurable business results and to gain competitive advantages.